Kick starting on Sunday 1st December HP Printers invited the Boo Roo and Tigger Too household down to Westfield White City for an exclusive event with printing fun, ice skating and meeting Santa. Unfortunately Tigger was ill with yet another chest and throat infection which meant that we were unable to attend the event. Luckily for us HP kindly sent us a wonderful package in the mail so that we could still take part in their HP Christmas Advent Challenge. Included inside the huge box that arrived was a HP Envy 4500 e-All-in-One Printer, printing supplies, craft supplies and a Christmas advent calendar. 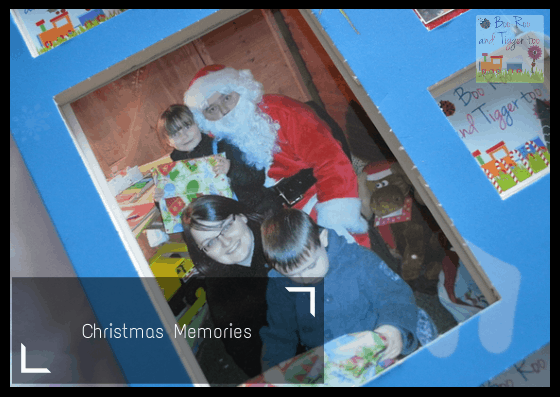 Hidden inside the box was also an envelope with six numbered envelopes and a little note explaining that alongside a yummy treat inside the advent calendar it also had another use… it was going to be our Christmas Advent Challenge. The numbered envelopes corresponded to the six larger windows on the calendar, it was only when I reached the first numbered envelope that I found out what was in store for us. 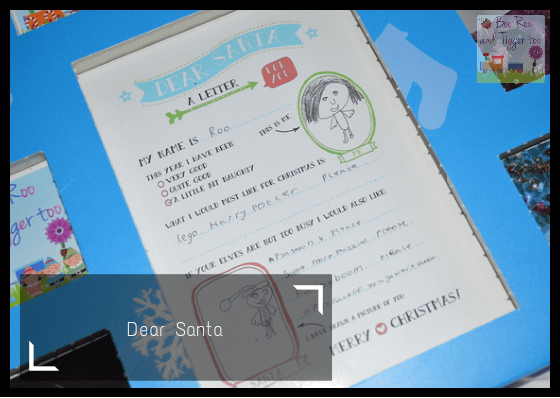 Each of the six challenges had us combining Christmas fun with different functionalities of the the HP Envy 4500 printer. I had so many ideas of how we get the perfect kiss under the mistletoe, where I would get Roo to snap Mr Boo and I having a cheeky smooch or if I could persuade Tigger to give Roo a Christmas kiss (he’s not to keen on kissing… I’m sure that will change when he is older). In the end Roo came up with the idea after we were looking at our Christmas hat collection. 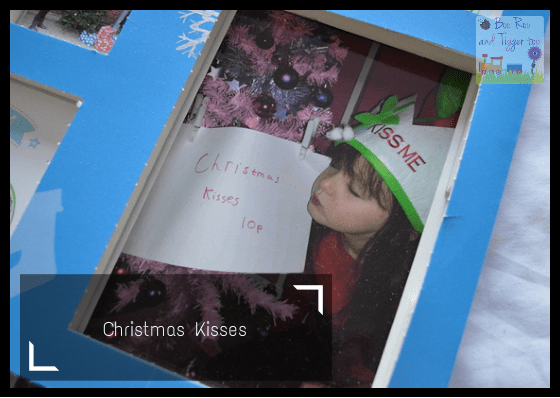 Selecting a ‘kiss me’ hat that we’d bought Mr Boo last year she decided to set up a kissing booth in her bedroom, she only made 20p! (and that came from me!). I really wanted to try and find a large nativity set up in a local store so that I could get us all to pose in front of it, however I was unable to find one so we decided to make our own. 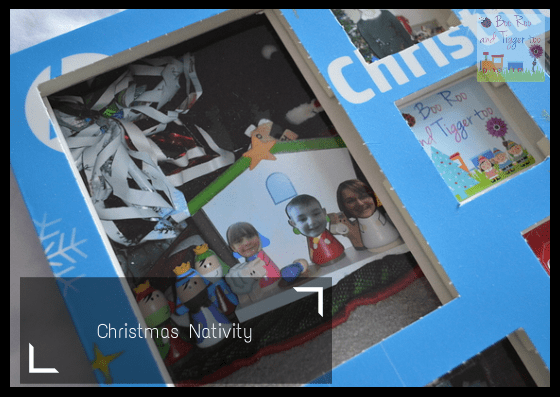 Printing out photos of ourselves, we cut out our heads and added them to the nativity scene that was sitting under our Christmas tree. Tigger thought that they were so funny and decided that they needed to stay on so we now have an alternative nativity scene. Writing lists to Santa is part and parcel of the build up to Christmas, so I sat Roo at the table to write her list (I did ask Tigger but he said that Santa was bringing trains!). I did chuckle to myself when Roo handed her wishlist over… This year I have been a little bit naughty (pleased to see she understands that her recent behaviour would have put her on the naughty list). All of the things she asked for she politely added please afterwards and the last request on her list? a photo of Santa and his wife! 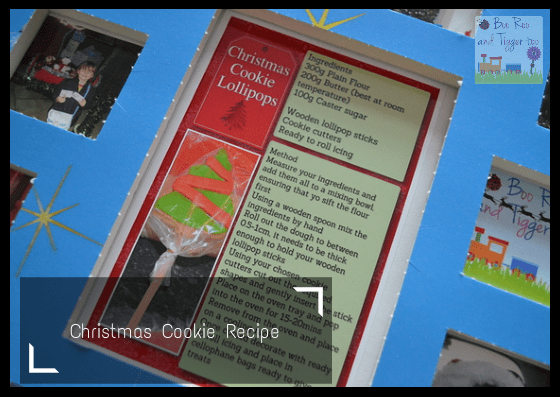 We’d recently had some Christmas Cookie Lollipops to take to school to hand out to Roo’s school friends as a little Christmas treat. 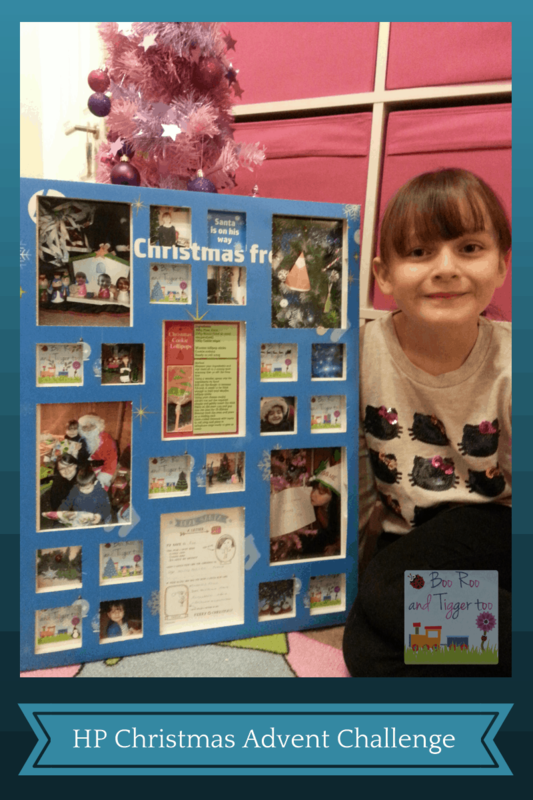 A couple of the mums had asked me for the recipe so using the HP Photo Creation software I was able to make little recipe cards that Roo could take in and hand out to her friends (Next year I will use these as gift tags on the treats). One of the things I notice more and more when I look back at photos of days out is that I’m not in them. I have very few photos of my parents from when I was their age and I want to be able to share photo memories with them when I am old and grey. So on our recent trip to see Santa so we could hand over our Christmas wish lists I wanted to make sure that I was in the picture, even if Tigger is more interested in opening his present. 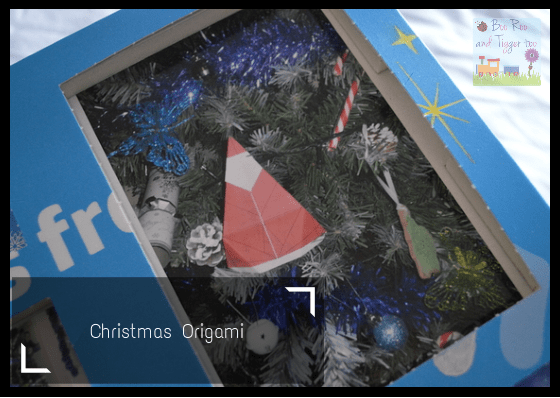 By far the most difficult challenge, who knew that Origami was so hard! I can not tell you the amount of times I looked, stared and shouted at the instructions in order to make our Santa tree decoration. Even our finished Santa doesn’t look half a good as the picture on the instructions. 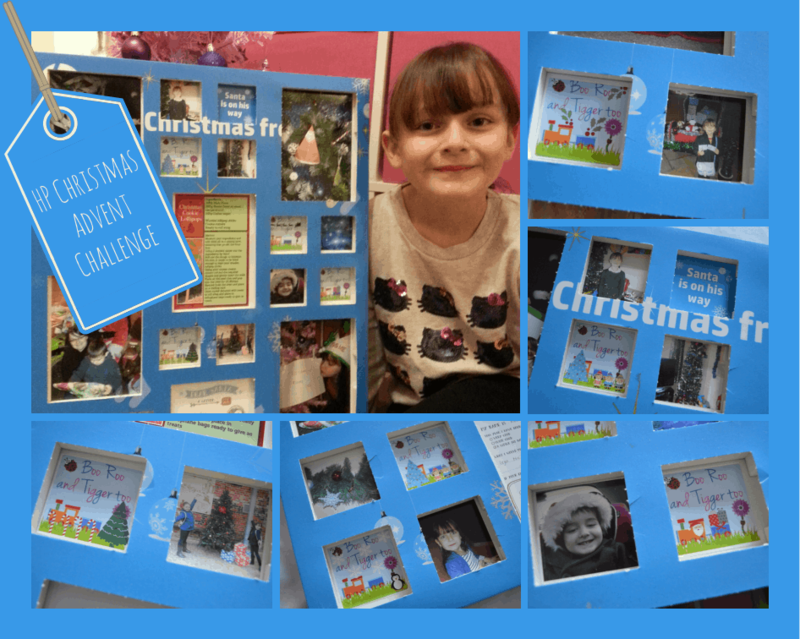 Having completed our challenges we decided to decorate the rest of the calendar with photos of things we had been up to over the festive season and have a little fun adding Christmas items to our familiar blog logo.